Food preparation is one of the most important aspects in your kitchen! Whether you're operating a bakery, cafe, deli, or 5-star restaurant, it's important to safely and effectively prepare your menu items. With the help of this 12" x 18" poly yellow cutting board, it is now easier than ever to practice safe methods! This cutting board is made of non-porous, high-density polyethylene meaning it won't stain and won't absorb any juices, bacteria, or odors. Also, due to its material composition, it won't dull your knife's blade. Use this cutting board for cutting any items; however, it is important to adapt a color code system in your restaurant to prevent cross-contamination and to engage in food allergy management. Great size cutting board very durable and easy to clean! Love the fact that these cutting boards are available in several colors as it makes it easy for our staff to distinguish which one to use, based on what material we are processing! This cutting board is ridiculously huge and will not fit in your dishwasher. If you ever want to cut roughly a football field of stuff, it's what you would go it. It's very sturdy and nice and thick. I love the size of this cutting board. It is perfect for what I need at my small restaurant. Especially when you don't have a lot of space. Very happy with the size, they're portable and work great for smaller batch chopping. They did start to warp a bit so a non-skid pad is definitely needed underneath. I wish there was a button for more stars. I bought these cutting boards for my meat processing room. I butcher 10 - 15 animals a year. We are always in need of great cutting boards that are easy to clean. These boards are the best I have ever used and I have been cutting meat for 30 years. The ones that I made from hardwoods can't compete. The are heavy duty so even my sharpest knives don't mar the surface easily. They are heavy enough that they stay in place while cutting and do not stick to the meat when removing it from the cutting surface. This is huge when you have a lot of processing to do. So easy to clean with soap and water, you don't even need a bristle brush or block scraper. I see these lasting me for the 5 years or more. If you are a hunter buy these boards. My only complaint is that I didn't order enough of them. This yellow cutting board, is made of good quality Polyethylene, won't absorb odors or food coloring, will handle any sharp knife without scratching; love the price too. Loving the different colored cutting boards for my catering. Yellow is for poultry! Sturdy for sure, and an unbelievable price in comparison to buying at a bulk store! I won't buy any other cutting board for my home kitchen anymore. These boards are larger and sturdier than the boards you typically find at a home store. Great price too. I love these cutting boards. They are small enough to put on any surface and are super sturdy and easy to clean. Highly recommended for small areas. I was looking for some cutting boards and I found the spot for it! Great board and I've already purchased three others like it! great product! Never expected to be excited about cutting boards. Never-the-less, having color coded cutting boards is nice. Pair a few different colors with a holding rack and you can keep yourself nice and organized. If you are going to work with raw poultry and want to prevent cross contamination you need this yellow cutting board! Great quality and price too! This is a very durable,long lasting, and inexpensive cutting board. The color code helps to protect cross contamination,etc. A must have item. Been using it over 1 year and still going strong. Simple cutting board, but it does the trick. Easy to wash and is durable enough to hold up for daily use in a high volume kitchen. I am so impressed with not only the quality but also the functionality of these cutting boards. I love that they are color-coded so there is never a chance of cross-contamination. I use the green for vegetables, the whites for fruits, the brown for cooked meat, the yellow for Poultry, red for raw meat, and the blue for fish. Theses are perfect for you staff to keep from cross contaminating food, They also have NSF printed right on them. I have these in multiple colors and love them. Great cutting board at a low cost. I'm glad I had the option to get a smaller board than the original size. It saves space on my food truck. Nice cutting board for the price! The reason for four stars is that they tend to warp as you wash them a lot in a professional machine. Heavy duty and can take lots of work. Great item to have to avoid cross-contamination in your kitchen. Affordable, durable, and easy to clean! We've had these for years and they are still going strong! These cutting boards are strong and I love the colors that they come in. It's very easy to know which color is for which item. There is a negative... They tend to slide around on the tables. These cutting boards are durable and easy to use and clean. We love that they're affordable enough to get the correct colors to avoid cross-contamination, yet still durable and good quality! 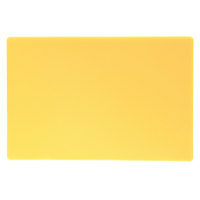 Bright yellow cutting board that is made of high quality, durable and heavy plastic. The size of the board works great for most of our cutting needs. These color coded cutting boards are great to prevent cross contamination and promote food saftey in the kitchen. We use these in coordinate with color coded knives and tongs for grilling/cooking. The board itself is sturdy, durable, and does not score easily. Very impressed. The yellow is bright! its great because you can clearly tell the difference between the different colors and it is easy to keep sanitary. I would suggest creating a chart or labels so everyone remembers which color is for which foods. The board itself works well. good for chicken always use color coded. best price you couldn't find anywhere else. so save your time buy everything at one time will save the shipping too. Durable, light weight, and color coded to ensure you don't mess up on your haccp program. They are also easy to clean and no bleaching. good quality at low price . i bought three different color for my all cutting need. good for restaurant cut a lot of salad ready to eat and raw meat. Intended specifically for raw poultry, this yellow color-coded cutting board is plenty big for most projects, lightweight, and thick enough to be plenty sturdy. I expect it to last me many years. Nice and heavy cutting boards good quality and strength, a very bright colored yellow great for use with Allergan foods, for color coding, a good strong cutting board, happy with this item. We bought these for our bakery use even though it's supposedly meant for raw poultry as described. We like these more than the intended white cutting boards given that these do not have a handle hole. The imprinted NSF logo is also a nice addition. this 12" x 18 " yellow cutting board is a really great item. easy to clean and easy to use. and with this price food safety has never been so easy. when it comes to food safety anything you can do to help protect your customers is well worth the effort. and color coded boards are a great way to help stop cross contamination. great value. these are good strong colours. They are sturdy no flex cutting boards. NSF is actually stamped in to the surface, so can't be removed/lost. very good value. This cutting board is functional, and we bought one in all the available colors, to avoid cross contamination. They are a perfect size for all types of prep and they fit in a standard dishwasher, too! Perfect size, love how the different colors help staff decide on what board to use, easy to store. Washes nicely. Not too heavy but not light weight and flimsy. Train cooks how to properly handle food with these relatively big color coded cutting boards. Nice for food allergies where you need a new board for specific ingredients. This is a great basic cutting board! It is good to travel with! Good board to incorporate food safety with this yellow board and other color coded boards!!! This product is sized with ample room to work. It is very durable and easy to clean with the brushes also sold at Webstaurant. Color coding eliminates the worry of cross contamination. Good purchase. I have purchased all the colors at this reasonable price. A versatile and functional cutting board. Our kitchen staff loves the size for food preparation and it is easy to clean. The color makes it stand out on our storage rack. this is very good price for the cutting board. we bought different colors to identify which is for what kind of food. they are very good to use.